California’s Working Landscapes – Annual Rangelands Fact Sheet, 2016 was produced by UC Rangelands for CRCC and Natural Resource Conservation Service as a resource for better understanding and decision-making. Grazing for Change I and II: Grazing for Change features ranchers throughout California who are stewarding our state’s wide open spaces. Take a moment to learn how ranchers are promoting endangered species, investing in public lands and conducting research to be better land managers. These stories are worth sharing. Grazing for Change II: Stories of Ranchers Preserving and Enhancing California’s Grasslands. Click here for full document. 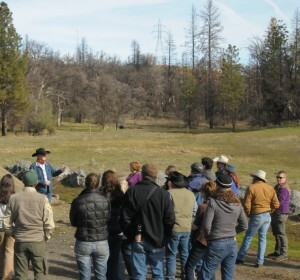 Grazing For Change I: Range and Watershed Management Success Stories in California. Click here for read the complete publication. The longtime thought that opposites attract exemplifies the relationship of George Whitten and Julie Sullivan of Blue Range Ranch, Saguache, Colo. Sullivan was a city girl, who spent her summers at the beach with dreams of being a dryad – tree spirit. Whitten was a ranch kid, who played in the dirt and helped out on his family’s sheep ranch. Click here to read the story. Native bees worth billions of dollars a year, researchers say. But the bees are disappearing as California’s rangelands are sold to developers. Click here to read the story. Bring on the cows. Save the rare flowers. An endangered yellow wildflower that a decade ago had dwindled to just 30 plants in its last Contra Costa County stronghold is rebounding with the help of cattle grazing. Click here to read the story. 2011 – Rangeland Coalition, partners and Farm Bill priorities features in the San Francisco Chronicle. “As I would ride up, it looked like the ground was moving – they was so thick,” Modoc County rancher Rodney Flournoy recalled his grandfather telling him in the mid-20th century. “I watched with pain as the numbers of those birds continued to decline. … It has been eight or 10 years since I have seen any anywhere, and I do mourn their passing.” Click here to read the story. The simple fact is that the only practical way we will retain sufficient habitat for the rangeland wildlife of California is through the maintenance of viable cattle ranching operations! A Sierra Club member shares his passion for birds and appreciation of California’s Rangelands. 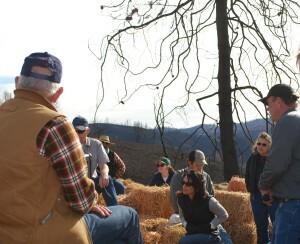 See why environmentalist and ranchers are finding common ground. Click here to read the story.